This one happened at Kanvas in New York City. Rami, my faithful companion, traveled with me to see the exhibit of Jim Cox photos of the "Oz" cast. 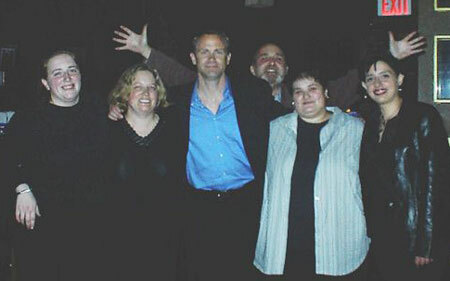 Several cast members, including Lee, were at the opening. When we arrived, the first actor I saw was Lee. That may have been because I was looking for him. He was surrounded by a group of very interested females, who I later found out included my Oz-list pals, Danielle and Nic. I hovered there for a bit, but those ladies were giving no ground. Then D. arrived with a friend. We looked around to see if we could spot anyone else and we spotted Christopher Meloni not too far beyond where Lee was standing. By this point, Lee slipped away from his admirers and we saw him giving Chris a wonderful hug that seemed to just go on and on. Even after they finished hugging, they didn't let go of each other. I couldn't stop smiling. Soon after, we went to the ladies room and then caught Lee on the way back at the top of the stairs. He gave D. a big hug and then I got one, too. He remembered meeting me in May in Washington, D.C., which really made my night. He was wearing a blue suit and tie with a light blue shirt. Chris was sitting behind where I was standing and apparently he motioned to Lee, cause Lee said something to the effect, "I'll be with you in a minute, sailor." D., Rami and I all just grinned at each other. Then Chris stood up and walked up to us and leaned in to say something. While he spoke, he put his hand on my back. I don't remember what he said, though. There was some more back and forth and then Chris came back again and put his hand on my back a second time. Rami got the same treatment. This time, he left his hand there a little longer. A bit later, Lee got up and rejoined our circle. Then this guy came up to him and started going on about how wonderful Lee was on Oz and said he'd been a fan since he saw Lee in "Point Break." So Lee starts yanking this guy's chain, saying he wasn't in "Point Break." Had him going too. I couldn't stop laughing, but this guy just kept going on, trying to prod Lee's memory. Lee would just not cut this guy any slack. Then this guy asked to have a picture with Lee, which prompted all of us to ask for the same. Again, mine came out rather dark, just like they did at the GLAAD bruncheon. I just don't have luck with Lee and pictures. Then Lee told us he had to leave to go somewhere with Sherman and Chris, but he told us he would be back. He gave us all a hug and a kiss goodbye. *sigh* Can you say perfect night? It took him 20 minutes to get out of the gallery because people kept stopping him. Finally, Chris and his wife, Sherman, came back in from the car and dragged Lee out. It was at this point, that I finally noticed other Oz actors in the gallery - Robert Clohessy, George Morforgen, Tom Mardrisonian, Kirk Acevedo, Kristin Rhodes, Michael White, Granville Adams, and Anthony Chisholm. I didn't speak to anyone of the other actors, but I did say hello to Leslie again and met Giovanni (from the C-M forum). Giovanni recognized my name from the LT board and told Leslie I was very big fan of Lee's. "Very, very, very big," he said. *bg* I wasn't sure if Leslie remembered me from the GLAAD brunch. At some point Rami and I sat down with D., Terry, Nic, Danielle and Giovanni to talk. We chatted for about an hour or so, hoping Lee would return. Sure enough, he did. And he came right over and sat down with us. I was beyond joy. He stayed and talked for awhile. He was very laid back and relaxed with us, which was so nice. He was also quite charming. I remembered that I had brought a T-shirt for him to sign. It was a collage of Beecher pics that Mav made for me and the first thing he commented on was the screen capture from the Variety episode where he is shirtless and sticking his tongue out. He seemed to be a bit dismayed about that selection, or at least he tried to make me to believe he was. I told him that these were my favorite pictures of him and he should be flattered. "I am, I am," he said. Then I asked him to sign it. "I was going to ask if you wanted me to, but I didn't want to presume." Good God. Presume already. He wrote, "Anne - What's to be so serious about? Peace Lee Tergesen." I guess he was referring to the fact that most of the pictures are serious Beecher pics. This T-shirt is going in a frame. After he signed it, I asked if I could give him a kiss on the cheek. He said yes, so I did and he gave me one back. I just could not believe how amazing this night was turning out. He got up to make a phone call and moved to another part of the sitting area, where there was a kind of padded bench. He had taken off his tie and just sort of slouched back on the bench and I just can't begin to tell you how good he looked. I hope to see him again in January if they have another DVD signing at Tower. In the meantime, I keep remembering and smiling. Rami, Me, Lee, Giovanni (behind), Nic and Danielle. Photo by D.